Reach measures the number of users. Reach is typically expressed as the percentage of all Internet users who visit a given site. So, for example, if a site like yahoo.com has a reach of 28%, this means that of all global Internet users measured by Alexa, 28% of them visit yahoo.com. Alexa’s one-week and three-month average reach are measures of daily reach, averaged over the specified time period. 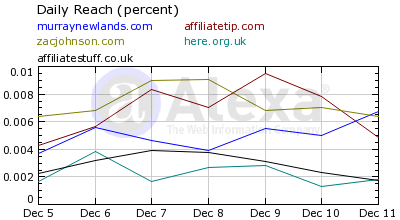 The three-month change is determined by comparing a site’s current reach with its values from three months ago. The trouble is that sometimes my Reach goes up when Google says I have less traffic and the reverse. Just to complicate things my server stats will sometimes agree with one of the other. I am not sure if there is an answer, but is driving me nuts and I thought I would share it so if you are reading this and experiencing the same challenge you will know you are not alone! Yeah, alexa is totally off, I get some sites ranked really high without much traffic while others ranked low with a ton of traffic. It just depends on the niche. I improved my website alexa very fast in a short time of 6 months but Google stats did not improved if i compare with the total time.